Hustled and Hassled in Havana | Travel? Yes Please! After an eventful first night in Havana, I woke up the next day excited to begin exploring the city. I couldn’t wait to ride in a classic car, admire the architecture, and experience the local culture. After breakfast we hopped in a beautiful 1951 Chev and had the driver take us to Plaza de la Catedral. It would be here, in a beautiful, historic square, that my enthusiasm for Havana would slowly start to die. As soon as we set foot in the Plaza, a tour guide approached us. He was very friendly, asking us questions about ourselves and where we were from. After nearly five minutes of small talk, he began to pitch us his tour, pulling out a laminated map of all the main sites he would take us to. “We just got here and want to explore on our own for a little while,” we explained as we started to move away. I started taking some pictures of Catedral de San Cristóbal and the surrounding square, but was soon interrupted by the tour guide. He was following us around, telling us little tidbits about what we were looking at. Again, we rejected his offer for a tour. He was very knowledgeable and personable, but I really just wanted to look around and take some photos, uninterrupted. The man let us be, but would approach us again shortly after. He was a nice a guy, very social and somehow managed to seem non-aggressive, even though he had approached us at least four times now. It was exhausting to keep having to say no, especially to someone who was trying to be helpful. Old Havana would be like this All. Day. Long. Everywhere we went people were asking us for things. It wasn’t just to take their tour, ride in their cab, or buy their CD. They started asking us for other things, things I had never been asked for before. What was unique about Havana, is that the people weren’t asking us for money. They were asking for basic items like toothpaste, soap, shampoo and deodorant. I had heard that in Cuba these items are hard to find in stores, and when they are available can be very expensive. We came prepared with small toiletry items to give away, but in our rush to explore, forgot them at the hotel our first day. Still, there was no escaping the constant hounding in Old Havana. Even in a museum, we were hassled by the staff. We tried to look around Castillo de la Real Fuerza, but every time we entered a room, the bored staff member sitting in the corner would approach us and ask for things. One staff member pulled us into a corner, out of view of the security cameras, so she couldn’t be seen talking to us. She asked for several personal hygiene items and was really surprised when we didn’t have a “present” for her. She said Canadians are very generous and usually bring stuff to donate. Then she started tugging at Mike’s shirt asking if we had one for her. This really put me off and was the first time I felt that maybe tourists were being taken advantage of, that the generosity had come to be expected. By this point I was well aware that the Cubans are in need of things, but I was getting frustrated that even in a museum we couldn’t escape the constant badgering. We remained polite and spent a lot of time listening to this lady’s story, but it was draining to have to keep saying we couldn’t help her. Making things even more awkward, she followed us around for the rest of our visit. What made it hard to say no to the people in Havana, was that they weren’t asking for money. They were asking for simple things that we North Americans take for granted- soap, toothpaste and milk. Another reason it was tough to say no, was that the people who approached us acted like they wanted to be our friend. They would strike up a friendly conversation, ask questions about ourselves, tell us interesting things about Cuba, and give us helpful advice. Just as the conversation got comfortable, we’d get asked for something. It was hard not to feel disappointed all the time. First and foremost, I was disappointed that the Cuban people had to ask for basic necessities to begin with. It was eye opening and made me feel very lucky to live in Canada. Next, I was disappointed that we couldn’t do more to help. We helped as much as we could, but there was only so much we could do. Lastly, I was disappointed that people we thought wanted to be our friend, really just wanted something from us. In Plaza Vieja, we stopped to look at our guidebook when a man approached us. “No thanks. We’re just trying to decide where to go next,” I said. He then began telling us about a salsa dance school where his wife teaches and his daughter dances. “Okay, we’ll go check it out,” I replied because I love to dance. We said goodbye and then started to walk off in the direction he pointed us. About a block later, the man had run to catch up with us. We now, unintentionally, ended up with our own personal, unofficial tour guide. This man took us down a ripped up street where there was barely a sidewalk to walk on. We were definitely away from the tourist zone, in an area where the locals lived and worked. 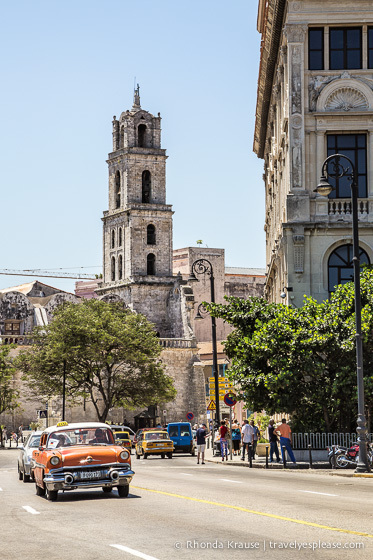 As run down and grungy as it was, we were excited to be seeing a more “real” side to Havana. The first place he showed us was a ration shop where the locals go to collect their government allotted food and cooking supplies for the month. It was April 1st, so the line up was long. The man took us into the dark, sparse shop. On the wall was a blackboard listing the products, prices and limits per person. The man wanted me to take a picture of the store, but I refused. As great as a photo would have been for the blog, I honestly wasn’t comfortable taking a photo. It felt disrespectful, insensitive. This is how people live- I didn’t want to treat it like a tourist attraction. After leaving the shop, we continued down the street as our new friend told us about Havana and life in Cuba. A short while later we arrived at the dance school. He showed us some photos on the wall of the different dance classes, pointing out his daughter in one of the pictures. The place was different than I expected. Since it was a dance club, I thought we’d be seeing some actual dancing, maybe even have the opportunity to do some salsa dancing myself. Turned out we really were just taken to a cafe in the same building as a dance school. It was fine, I guess- there was a live band and it was nice to get out of the heat and enjoy a cold drink. Sitting at the table we continued to have quite a good conversation with our new friend. It was fascinating to get an insiders perspective about life in Havana and I was feeling lucky to have had this experience. Then the conversation began to shift. “Do you want to buy some cigars?” he asked Mike. “Yes, I was planning on buying some cigars,” Mike answered. “Yeah sure, we’ll go with you to your friend’s store,” Mike answered as my instincts started to tingle with suspicion. I really did not want to go anywhere else with this guy, especially now that he was asking for things. I think Mike was intentionally avoiding my gaze because he knew I was giving him “the look”, my way of saying let’s get on with our day. I’m not sure why the policeman stopped him, but he let him go after inspecting his ID cards. So, we continued on down the street. All of a sudden the man said “Here. Come over here,” motioning us to a door. He was looking around as if he didn’t want to be seen leading us into this building. “Is this your house?” I asked. “No. Quickly, inside,” he bluntly ordered. Before I knew it, Mike was inside looking out at me still standing on the street. “Just come in,” Mike urged. As I walked into the house, all sorts of terrible thoughts flooded my mind. For a brief second, I pictured us being held up, beaten and robbed. As the door slammed shut behind me, I saw the man turn the lock. To the right of me, I saw a small table with some boxes of cigars on them. I relaxed a little bit once I saw this, but was still trying to piece together just where we were. It looked like we were in someone’s living room, but there was a curtain partially blocking off a back room that had some people milling about. I didn’t know if this was a store, or a house, or what it was. The man handed her some sort of documents, which she took back behind the curtain. She then reappeared, approached the cigar table and began showing us the different boxes. The four of us started some intense negotiations and eventually agreed upon a price for a box of 25 Monte Cristo number four cigars. She packed them up for us and then we were quickly ushered out of the house. Our new “friend” practically shut the door on us! “I just need some milk. For my daughter,” he pleaded, a sad look on his face. So, off we went, following this man to a store where we could buy some milk. Upon entering the store, I was relieved that it actually looked like a real shop. The man took us to the counter and asked the cashier for one month’s ration of milk. She turned to the shelf behind her and began pulling off bags of powdered milk. One…two…three bags of milk were put into the grocery bag. At the till she rang up a price of 17.50 CUC. The lady pressed some buttons on the till, and up popped a price of 5.75. “Okay. We’ll buy one.” I said firmly. We gave the lady our money and handed over the bag of milk. The man thanked us and we hurried away, never to see him again. At first I felt okay about the whole cigar situation we got ourselves into. Mike got his cigars, our friend got his rations, and we all have a good story to tell. But the longer I thought about it, the more uneasy it made me feel. Don’t get me wrong, I’m glad we could help this man in a small way. The money we spent was insignificant to us, but probably made the world of difference to this guy. However, I couldn’t shake the feeling that maybe we were played the fool. That night at the Tropicana, we started to tell this story to another couple at our table. Turns out almost the exact same thing happened to them! Now we really felt like we were scammed! As a tourist, it’s sometimes hard to know someone’s motivation for engaging in conversation with you. Was it that these people really just wanted to talk and be friendly, later feeling comfortable enough to ask for what they needed? Or did they approach us with the intent of asking for things all along? When we started to pay close attention, Mike noticed that all the women who were asking us for things, were wearing makeup, had their hair done nicely, sometimes even with highlights. They were dressed reasonably well- nothing fancy, but their clothes weren’t dirty or tattered. The man we bought milk for was actually dressed very well, in clean dress pants and a buttoned up shirt. We began feeling internally conflicted- these people didn’t look “needy”, at least on the surface. Back home, it’s easy to tell which people on the street are living without life’s basic necessities. Their clothes are old, their hair is dirty and their body doesn’t look healthy. We did see a few cases like this in Cuba, but in our experience, these weren’t the people who were asking us for things. Why? Why are they asking us for stuff? How can they have makeup, but no toothpaste? How can they have nice clothes, but no deodorant? Why was everyone asking us for milk? They get food rations, why don’t they get milk? It didn’t make sense to us because we come from a far different world. We were in Havana for just a few days, so we can only make assumptions, but the best explanation we could come up with was this: Everyone wants a piece of the pie. People will always want more. We can’t judge or blame these people for wanting the things that we, in North America, attain so easily. The people in Havana see us walking around their town, not a care in the world, with easy access to all the toothpaste, soap and shampoo we need back at the hotel. I kept thinking, it must be hard to see people come to your town who essentially “have it all”, and know that you are not afforded the same luxuries and freedoms. Truthfully, if we were in the same situation, we would probably want what the tourists have too. I think it’s only natural. It’s hard to say if we would be so upfront and ask for things the way they do in Havana, but we would definitely be wanting more. Heck, even in our privileged society, people are always wanting more. It’s not enough to have a house- people tend to want a bigger house, a newer house, a house with more amenities. For the rations, people get rice, beans, sugar, salt and cooking oil. Each month, they are given one leg of chicken per person. Children under seven are provided with one litre of milk a day. A special diet is designed for pregnant women and diabetics. The food rations are not enough to last the month, but people are able to buy more, if they can afford it. Cuba has a dual currency system. Cubans are paid in pesos, but can only use them for certain things like public transportation and paying utility bills. For many other things, the convertible peso (which is what tourists use) is required. Approximately 24 pesos= 1 convertible peso. The average salary is around 350 pesos a month. In a family, both the husband and wife need to work, sometimes two jobs, just to get by. A lot of University educated people quit their jobs to work at hotels. The salaries are not very big, but the tips and gifts they get from tourists make up for it. The reason why people are asking for toothpaste and deodorant, is because these products can’t be found in stores right now. It used to be that soap and shampoo weren’t available, but now they are. Our guide didn’t know why personal hygiene items are often not in stores. Cuban people are not proud of what goes on in Havana (in reference to how they pester tourists for things). She said the people who do that are making fun of tourists and it’s not like that elsewhere in Cuba. If you want to give to people, give to those who are gracious and don’t ask for anything. We didn’t get scammed on the price of milk- it should cost 5.75 CUC. However, there is a scam that’s run near the Capitolio, which is to take tourists to a store and charge them 20 CUC for one bag of milk. Our 3 days in Havana were exhausting. I started out very enthusiastic about the city, and we did have fun, but it quickly ran me to the ground. It’s extremely difficult to say no all day long, especially to friendly people you do wish you could help. We tried not get frustrated, but after a while that’s how we started to feel. On our third and final day, we didn’t even leave the hotel. I didn’t want to be asked to take a taxi, or a carriage, or a tour. I didn’t want to be asked to buy milk or anything else. I felt overwhelmed and didn’t want to be hassled in Havana anymore. Havana is the first city I quit on. I just gave up. And I never give up when I travel. I stay active all day and late into the night, trying to get the most out of my trip. But Havana wore me down. What was supposed to be a relaxing vacation had become a stressful experience- one that confused me rather than leaving me feeling happy and relaxed. Havana, and Cuba in general, is a place that left me with a lot of questions, more so than any other place I have visited. Usually when I travel to a country, I come home with a somewhat good understanding of the culture, lifestyle, history etc. But Cuba left me with more questions than answers. For weeks after our trip I could not stop thinking about our visit. I wanted to know more about the regime, the way of life, and the conditions in which people live. Since we’ve returned home, I’ve been doing a lot of research about Cuba, trying to find explanations for what we saw/experienced during our short time there. It’s a complicated country, both in regards to its history and present situation. Is the communist government to blame? The US embargo? There are a lot of factors at play and there is no easy answer. I can’t claim to know much about the politics surrounding Cuba after one short trip. However, what I do know is that things are slowly changing, and they appear to be changing in a positive way, allowing Cuban residents more freedoms. Yes! I don’t regret going to Havana at all. It was definitely worth seeing and we did have a lot of fun. I loved the music, the architecture, the colours, the cars. Even the people, as frustrating as some were at times, were always very friendly, kind and helpful. I don’t, by any means, consider our experience in Havana to be a bad one. Yes, it was a little stressful, but that’s because I chose to spend my time wondering “Why?” about everything. As nice as it is to have a relaxing vacation, I think it’s important to learn about the country you’re visiting. I’m glad we had the experience we did, even though it was uncomfortable at times. It helped put things in perspective and we came home much more appreciative of the life we have in Canada. Our hope is that one day, the lovely people of Cuba get to experience the same freedoms and comforts that we are lucky enough to enjoy as Canadians. RUSS - Whenever I’m traveling, I love to explore places that are not on the reviews of travel sites. I have always believed that this is gives a greater chance to interact with locals and to see a city’s culture like the real thing. BUT I would have gotten deathly afraid if I had something like that scenario with the cigar guy. It’s nice that you had some items that you could give to the locals. That was very good of you. Rhonda Krause - Oh, it was a completely stupid situation to have gotten into. I’m just glad nothing bad happened. While it was great to learn about life from a local, we should have been more cautious. Ryan Biddulph - Wow Rhonda! I can see how this would be agitating, the hounding, and the cigar episode could have went South. Crazy. I recall a guy in Kathmandu who asked if we wanted him to take us around town. No money at all he said, just as friends. We said nope, he insisted, no money. Fine, after hounding, we mistakently gave in. 20 minutes later he asked for a few things for his family. Food items. I stressed only a few, he said OK, he’d ask us at the end. Then at the end, he brings us to a local shop, and he picks out $50 – USD – of groceries LOL! We laughed at him, and offered him $10, and he said he could take it. Then I talked about karma, and being honest, and simply being up front, and he wouldn’t be in that position, trying to take advantage of our kindness. I get why he’s desperate, but instead of ignoring it, or just getting angry, I gave him a few bucks – which he refused to accept – and simply explained how honesty is prospering. Rhonda Krause - That’s a great story, Ryan. I agree about the need to be honest, rather than posing as a friend. But I guess, that’s what makes it harder for people to say no. We would have been glad to help this man, but the sly way he went about things left me feeling used. It still doesn’t sit right with me, weeks after the fact. I’d rather have helped someone who was gracious and honest. Oh well, lesson learned. Frank - Your story an almost exact copy of our trip to Havana! We found it beautiful and interesting – but exhausting. Like you we were hounded for bathroom supplies and Spanky actually went back to the hotel, packed up our extras, and ended up giving them a lady who she had struck up a conversation with. Being asked for stuff was pretty constant. The only scam we were faced with however was with someone wanting to convert our dollars to pesos…we didn’t fall for that. Watch out for that, it’s a common scam – they try to get you all confused between CUCs and pesos and will try to give you moneda nacional at par with USD. But like you say: 1) Havana only place where it seems to happen. We loved Trinidad and didn’t get hassled at all. 2) Despite everything, we always felt safe in Cuba, including Havana. Rhonda Krause - We did bust a cab driver who tried to give us our change in pesos rather than CUCs. We were always watching for that and he was not happy when we called him on it! Havana was the only place in Cuba we were asked for things (which was a relief). Like you, I never felt unsafe in Cuba at all, except for a brief moment when the man locked the door to the cigar “shop”. If he hadn’t have locked the door, I probably wouldn’t have been concerned. Shaun - Too bad about your sour experience. The pictures of a country stuck in in 50’s is really inviting and has had me wanting to visit Cuba. You will find being hassled a part of visiting many poor countries and unfourtanetly it is part of traveling in those places. Sounds odd but it helps to budget for scams and handouts. In the end is an extra few $$ really worth getting so upset? Great pictures though and glad you still enjoyed your time. Rhonda Krause - Cuba is a great country and although it is very poor, Havana was the only place people asked us for things. We weren’t upset about the money at all. Like I said, it really was insignificant to us, but probably made the world of difference to this man. I was more bothered at the deception behind it. Maybe people who go to Havana and turn a blind eye, wouldn’t have been so exhausted by it all, but I really spent a lot of time trying to understand why things are the way they are in Havana. Rhonda Krause - Yes, things are really difficult for the people of Cuba. I’m glad we had this experience as well because we got to see Havana through the eyes of a local, even though he did ask for things from us in the end. Our time in Havana opened our eyes and really got me to think, question and try to understand, which I believe is an important part of travelling. I definitely don’t have any answers to why things are the way they are- I just tried to shed light on the situation from a few differing view points. On the other hand, cubans are people who are more interested in their looks….i said….cubans prefer buy a nike pair of shoes that a toothpast…. The last, cubans are islanders and we thing in an “absolute” way, i mean, if we like a restaurant….we say “this restaurant is the best im the world” even if we just visited two restaurants in our whole life. So, in cuba it is very commoun to thing that cuban and cuban things are the best in the world even the government blocks information so what cubans know about other things around the world is limited. With this, you understand that it is real cubansthings tourists are soft and so kind of stupid, and believe me they know you see them as”poor cubans, they not have anything” and they use this to ask you. I’m going to Cuba soon and I was wondering which bus company you took to go to Varadero from Havana?